… you are still attracted to the lesson. What is it that keeps us stuck in certain situations and with certain people? 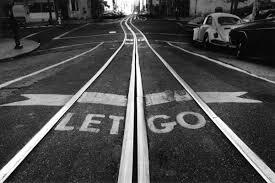 Why can’t we let go when we know we SHOULD let go? The answer is pretty clear. If you’re still attracted to a person or a situation, there is a lesson there that you have not yet internalized. For when you get the learning from any situation in life, you are always ready to move on from it – in fact, you are excited to move on from it. So if you find yourself obsessively trying to break free from a person or a situation but unable to do so, it is really time to look in the mirror and ask yourself what is the lesson here – what is the real learning? Why am I not able to move forward with my life? What is keeping me in the same repetitive pattern of unhappiness? In order to help you find the lesson, look back to previous relationships and situations, see if you can detect the pattern. Once you do the work on finding the lesson, the lesson stops and you are free to move forward in a more constructive and fulfilling way. Don’t beat yourself up for not being able to move forward. You are not weak and it’s not that you need a given person or situation in your life to be happy. It is only that you have not yet learned what needs to be learned from these people/situations and that is why you are finding yourself stuck and unable to break free. Do the work, get the lesson and get out. Your life is waiting to move forward – the rest is up to you. Good post. An interesting thing that i've found is that when im ready to give up on my relationship, the other half takes over. This happens with bluey. Just when im about to quit, she hustles, even if i dont say anything, i just think it and it works, curious for any advice to be make this healthier- as theres gotta be a better way to 'create' this relationship in a way were aligned. Thoughts?